Wessex was an old Anglo-Saxon kingdom before England became one country. It was one of seven kingdoms which covered England. It was named after the West Saxons and was situated in the south and southwest of England. 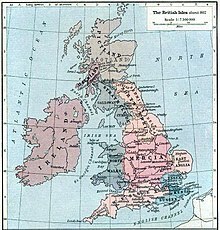 It existed as a kingdom from the 6th century until the English state was made in the 9th century, and as an earldom between 1016 and 1066. "Wessex" has not had any official existence since that time, but we use the term Wessex for that area of England when talking about history. The 19th century novelist Thomas Hardy wrote about Wessex in his books which tell stories set in that area. His Royal Highness The Prince Edward was given the title "Earl of Wessex" when he married Sophie who became the Countess of Wessex. The title Earl of Wessex had not been used since the last earl, King Harold Godwinson, was killed at the Battle of Hastings in 1066. This page was last changed on 26 August 2014, at 15:31.